Meeting each morning as an opportunity for prayer and love – in motherhood, in the workplace, in the many nooks and crannies of the world – that is possible. And it strengthens us for the heroic, the impossible, the possible-only-with God. That is the secret of St. Gianna, Claire Dwyer reveals. Dan Burke and guest host, Stephanie Burke, speak with Fr. William Watson about awakening the awareness of The Divine in your life. 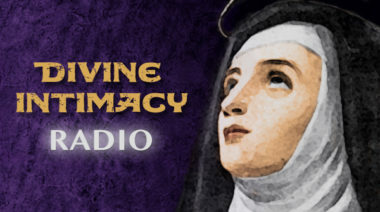 Dan Burke and Melissa Elson answer your questions about emotions in prayer and helping loved ones come to Christ in this edition of Divine Intimacy Radio. Find out how to combat the wiles of the devil using the weapons of heaven and the power of prayer. What posts on SpiritualDirection.com address Ignatian Spirituality? Find out in this list of Ignatian Spirituality posts found on our site. The enemy has a plan to keep us quiet during spiritual desolation. Listen as Dan and Melissa discuss ways out of this trap of the enemy and into the light of deeper prayer and union with God. The enemy’s might is always subject to the power of God, and the deep roots of our prayer life are a participation in God’s power over the enemy of our souls. Dan Burke and Melissa Elson discuss how the rules of Saint Ignatius of Loyola’s Discernment of Spirits have impacted their personal voyages. Curious about the difference between aridity and desolation in the life of prayer? Listen as Dan and Melissa discuss on this week’s episode. The soul that is actively seeking God is a target of the enemy of souls. Listen as Dan and Melissa talk about St. Ignatius’ Seventh Rule and how to resist the enemy’s agitations on the path to deeper prayer.